With the October gypsy blood flowing, Nevada is a memory long past in our rearview mirrors. A few down weeks in Pahrump with storage while we both moved about the country. A relatively convenient airport. A place to replace our two Deka 8A27M chassis batteries that were slowly failing. For everything there is a season, and now is the season to move south. Colder temperatures are coming to the desert, and we’re both ready to spend the winter close to the ocean – surf, sand and sailing. These weeks have taught me several valuable lessons about our travels, and the famous quote “the best laid plans of mice and men” rings true to this day. Even though extensive internet research, planning, and poring over satellite footage may lead one to believe that a potential boondocking spot will work, roads not suitable for a 41’ Class A beast may prove otherwise once you arrive. When your Plan B is 50 miles away and it’s already late afternoon, you quickly move out of ‘I must have a beautiful view’ into ‘I must have somewhere to park so I can sleep tonight’. So much for our intended spot outside the north entrance to Joshua Tree National Park. Which leads me to my second lesson. Not all Walmarts allow overnight dry camping, driven by local ordinances or politics around sharing a lot with other prime businesses. 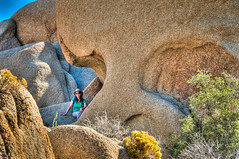 Like the one in Yucca Valley, California. 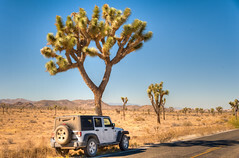 California Welcome Centers DO allow overnight camping, and are staffed with very friendly folks. Although the parking lot is about as level as the Titanic foredeck as it was sinking, and it’s certainly nowhere near as nice as our intended boondocking spot, the CWC in Yucca Valley was still close enough for us to explore Joshua Tree relatively conveniently. 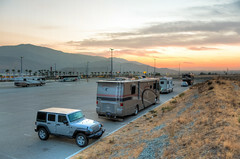 Casino Camping is just like Blacktop Boondocking, only with nighttime security and a convenient buffet. Most casinos don’t care how long you call their overflow lots home, assuming that you will patronize their establishment. Morongo Casino in Cabazon, CA is one of these, with a fantastic buffet and all the gaming that your heart could possibly desire. We’re not gamblers, but we took advantage of their inexpensive buffet for our anniversary dinner. Once again, it’s time to hit the road southbound – a few weeks at the Jojoba Hills Escapee park in Aguanga before we put the rig in storage and head to Hawaii for some much needed vacation downtime.